This time the plot feels a lot like the Asia Circuit Arc, but still different enough to be considered fresh with the inclusion of the Quatre Knights, especially when Kai takes over the main role. As someone who has watched and enjoyed all the past seasons, this one really sticks out due to the sudden disappearance of Aichi. Through the first 3 episodes, the plot is more relevant this time and the show dedicates time to develop our side characters. The cardfights feel exciting thanks to the new "Legion" mechanic, also known as Dual Battle with your Vanguard. It prevents the game from getting too stale before reaching to Limit Break, can't wait to see what other surprises Bushiroad has in store for us! 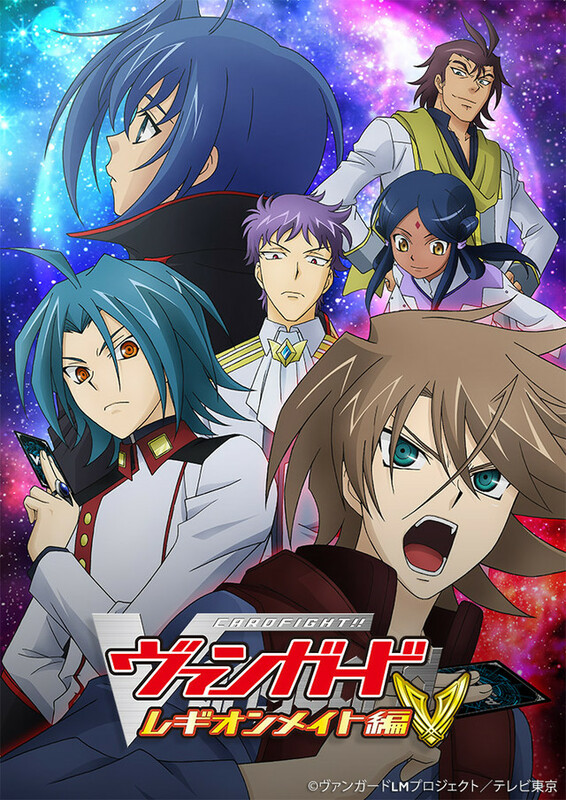 This is without a doubt the best show in the world, in which Aichi turns into a Disney princess and Kai, his dashing knight seeks to free him from his prison. He must take down the 4 Quatre Knights to free Aichi from the clutches of the evil void! On a more serious note, Legion Mate is a great fourth season to vanguard, incorporating that over-the-top-card-games-are-life(-or-death) feel that was persistent in the earlier seasons. Kai as the main character allows us more insight into his personality - and he shows us more emotion and personality than in the first 3 seasons combined. We're introduced to new characters, and there's a whole new plot twist to explore (that is, the disappearance of Aichi Sendou), as well as plenty of cardfights. Season 4 must be the worst season so far in a series that started out great with season 1 and then gradualy got worse until the 4th season now ended. The 5 season is with a completely new set of characters and set 3 years into the feature. Strange that the main person in this series, Aichi, hardly got to show himself in season 4. My conclusions is, watch the 1 season and forget that the rest exists. This season is absolute garbage! This is unbelievably bad! Previous seasons of Vanguard had issues with the "good guys" losing their card fights way more than they should, but season 4 takes the cake hands down. It seems like absolutely no "good guy" ever wins a card fight against a "bad guy", as well as it also seems like every single card fight ends the same way: "Oh look the 'good guy' is about to win in just one more attack!" Then comes the "Guard!" shout from the "bad guy", which is then followed by the bad guy's version of "Seek the mate! ", and then the "good guy" loses. Rinse and repeat for almost every fight all the way to the end of the season. Seriously I'm not even exaggerating this! What makes matters worse, is after every fight they loose, they start moping around with the "Woe is me" attitude, but then they start saying things like "Aichi is my mate, so I am going to rescue him!" Next thing you know, a "good guy" is card fighting a "bad guy" and loses again. Seriously, rinse and repeat throughout the entire season. Ugh!